Berries of all types are wonderful additions to a healthy diet, providing nutrients, fiber, and flavor. Two new berries have been developed, thanks to scientists at the Agricultural Research Service's Horticultural Crops Research Unit in Corvallis, Oregon, and their collaborators. 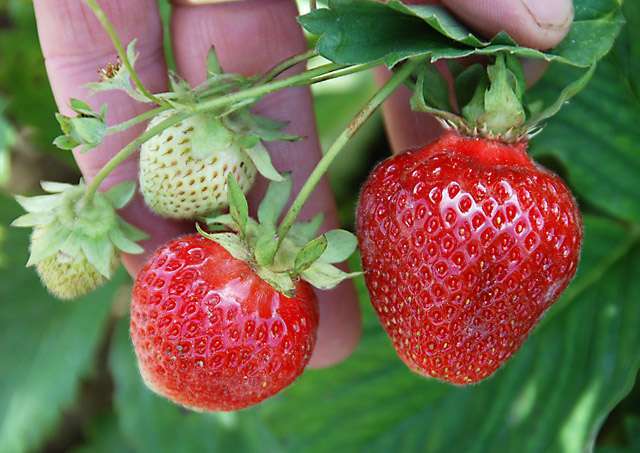 Sweet Sunrise (U.S.PP 25,223) is a new strawberry cultivar from the Corvallis breeding program, which is led by ARS plant geneticist Chad Finn. Sweet Sunrise was released in cooperation with the Oregon Agricultural Experiment Station (OAES) and Washington State University's Agricultural Research Center. 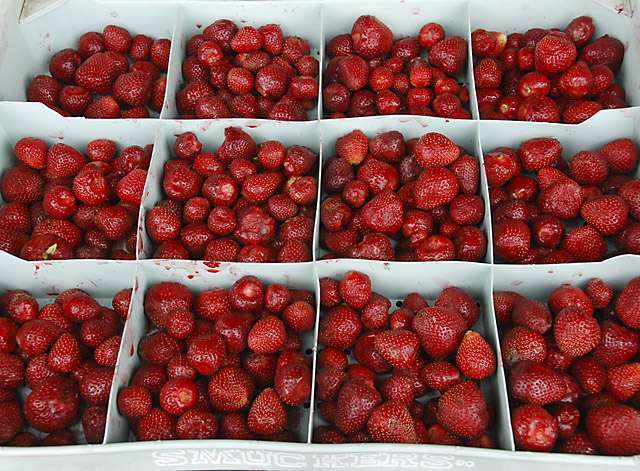 The new strawberry is a high-yielding cultivar that ripens in June. It produces large, firm, attractive fruit with excellent quality. According to Finn, Sweet Sunrise was high yielding in every trial and location. Yields were comparable to, or higher than, those of other recent releases such as Charm, Valley Red, and Sweet Bliss or the industry standards Tillamook, Totem, and Hood. In all evaluations, Sweet Sunrise was rated excellent and comparable to Totem for commercial processors. The most outstanding characteristics of Sweet Sunrise are its outstanding fruit quality, its medium-large fruit size, and its early ripening. These characteristics make it well suited for the fresh or processed fruit markets. "Sweet Sunrise was selected in 2000 from a cross made in 1998 between Puget Reliance and B 754. Puget Reliance is a standard in the Pacific Northwest, especially for the fresh-market strawberry industry, because it is high yielding, large fruited, and well adapted to the region's climate and disease complexes," says Finn. "B 754 was an advanced selection in ARS's Beltsville breeding program in the 1980s and 1990s. I identified it as being potentially valuable germplasm for the breeding program in Oregon because of its large attractive fruit, very good eating quality, and perceived high yield." Finn also developed Columbia Star (U.S. patent applied for), a thornless, trailing blackberry cultivar from the same breeding program as Sweet Sunrise. Columbia Star was released in 2013 in cooperation with OAES. 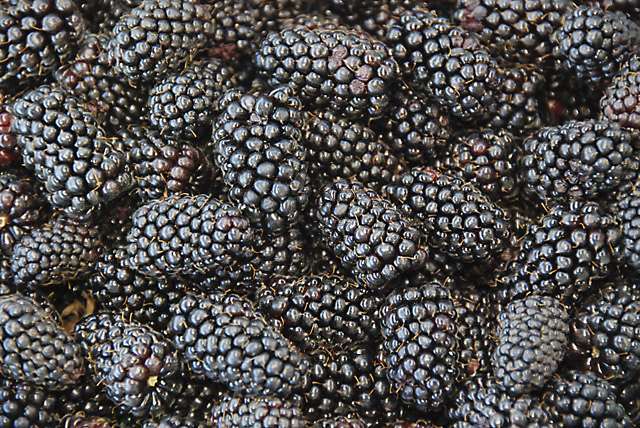 The new blackberry is a very high-quality, high-yielding, machine-harvestable blackberry with firm, sweet fruit that, when processed, is similar in quality to or better than fruit from the industry standards Marion and Black Diamond. Columbia Star can be adapted to areas where other trailing blackberries can be grown successfully. A patent is pending for this cultivar. "Columbia Star's background is extremely diverse," says Finn. "Marion accounts for 20 percent of Columbia Star's pedigree. The two immediate parents represented elite selections from New Zealand and the Oregon breeding programs. "Both of these new berry cultivars will be good additions to the fresh- and processed-fruit markets," Finn says.